Taylor Swift was awarded the Original Interactive Program Emmy for her AMEX Unstaged: Taylor Swift Experience this week, but, being Taylor Swift and therefore very busy and important, wasn't able to head along to the awards to pick it up. So instead, the nice people behind the Emmys shipped it to her overnight, so she would wake up the next day, Emmy in hand. Of course, having your Emmy award shipped to you doesn't mean you should miss out on all the awards show fun. Taylor did her own version of dressing up for the red carpet and sitting through speeches: a mini photoshoot with her new Emmy statue buddy, posted on Instagram for our enjoyment. Here, Taylor enjoys receiving her Emmy: "WHEN THEY OVERNIGHT YOU AN EMMY I DID NOT KNOW THIS WAS A THING"
She is a gracious winner, even letting other people hold her Emmy. Which is not what we would do. Our Emmy would be attached to a chain that we would wear around our neck at all times. Sure, it would be heavy, but at least you'd look down in the shower and have the pride of being an Emmy winner, always. 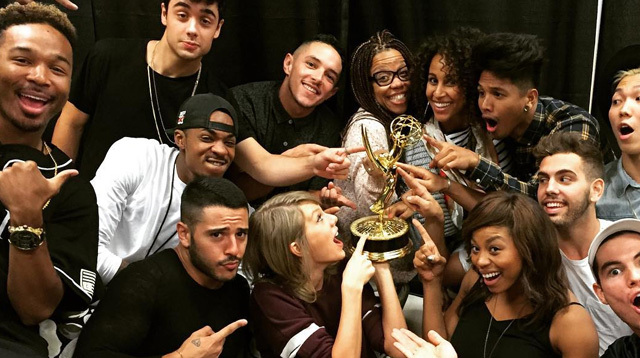 Taylor even lets her mate do a pretend Emmys speech. And lets another one wear it as a hat. She is a kind ruler. The Emmy has unforeseen side effects, like the loss of chill. "We have no chill," despairs Taylor. "The Emmy has rendered us chill-less." How will Taylor regain her chill, people? Have you seen what you have done, Emmy awards people? DO YOU SEE THE LIVES YOU ARE RUINING? Fingers crossed that the Emmy award is now in a special shrine in Taylor's house, to be taken out only for selfie opportunities and occasional playtime with Meredith and Olivia.